Every builder knows how important it is to use the best materials and methods for foundations work. We stock a wide range of engineering bricks and building blocks and can also obtain most types of facing bricks to order. We keep a wide range of brickwork accessories such as wall ties/DPC's/wall starters/frame ties/cavity closers/air bricks & liners/weep vents and cavity insulation in stock. 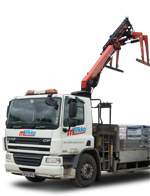 For a definitive range of building materials from the leading brands at competitive prices, call Merkko on 01865 820 090. Free delivery on all orders ex-stock. We specialise in supplying cut and bent steel reinforcement to structural engineers' schedules.